Love Belvin: Love Delivered (Waiting to Breathe Series Book 2) – It's Lily O. Several weeks ago, I reviewed Love Belvin’s Love Delayed. While I thoroughly enjoyed the overall story, the abrupt ending infuriated me. In my recommendation, I was unsure of whether or not I would read Love Delivered. I guess I am a masochist because I marked the release date on my calendar and purchased it immediately when I heard of its early release. Seven years ago Princeton Student Elizabeth “Zoey” Barrett met, befriended, fell in love and had a child with NBA superstar Stenton Rodgers. Their world-wind romance ended as quickly as it began leaving them both waiting to breathe. Despite their strong feelings towards each other, Zoey and Stenton successfully co-parent their son, Jordan. Their success as co-parents does not translate into success with their romantic relationship. Girlfriends, Fiancés, anger and resentment have kept Zoey and Stenton apart. Will they ever breathe again? For information on my book rating system, please check out this link. In Love Delivered Zoey becomes grown woman and stands up for herself. I was rooting for her to win, what, I’m not sure, but I wanted Zoey to win. I like that Zoey was a mom. She had to breast feed Jordan, take care of him, make arrangements for childcare and acknowledge his existence. In Romance novels children can become props, only picked up and mentioned when necessary, Love Belvin breaks the mold. I like to think that I am a nonviolent person, but Stenton made me want to reach through my Kindle screen and slap some sense into him. I lost respect for him in Love Delivered. He wanted Zoey to grow, but he appears to need growth just as much, if not more, than Zoey. He selfishly did what he wanted and expected things to magically fall into place. The supporting characters that served a purpose in Love Delivered were surprisingly less vocal this time. One supporting character and her family made me wonder what goes on behind the scenes in a real-life prominent Hollywood family. My only issue was the fact that only one person spoke out about the way Stenton was treating Zoey, and he had an ulterior motive. I find it hard to believe that no one in Zoey’s inner circle spoke out about how Stenton was treating her. Stenton treated Zoey like I treat a new pair of shoes. I knew I loved them the moment I saw them, but I have to wait for the perfect time to wear them. If Zoey were my sister, I would despise Stenton for stringing her along. One supporting character stood out to me ( Hi Ezra 😉 ) I would like to read his story. 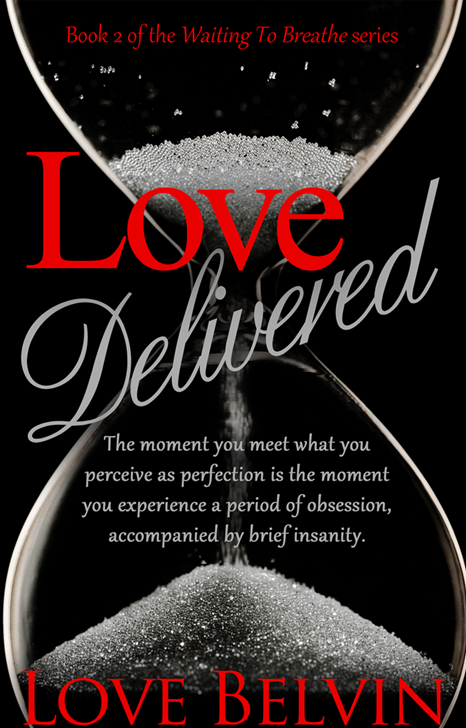 Love Delivered begins where Love Delayed ends, in the middle of a stinking, shocking, hot mess. Elizabeth “Zoey” Barrett and Stenton Rodgers are both reeling from the revelation of the truth and while they figure out how to go about life, we learn what has kept them apart for SEVEN YEARS. The storyline held my interest the entire time. While there were numerous plot twists, they each held on to reality and made sense. Like Love Delayed, the timeline became muddled to me. Several times I had to backtrack to remind myself what year the events were taking place. I squealed and jumped for joy when I read the table of contents and saw “epilogue.” If Zoey and Stenton’s story did not end with this book, I was prepared to riot. After reading both books, I now understand why Love Belvin didn’t conclude after one book. It wouldn’t make sense to end with roses and sunshine, when it is not a roses and sunshine situation. If Zoey and Stenton’s story ended in a single book, it wouldn’t have been true to them as a couple. DO NOT READ THIS BOOK IF YOU HAVE NOT READ LOVE DELAYED ( please 🙂 ). If you like romance (the soul-searching kind), stories that blend reality and fantasy well, and roller coaster rides. Check this series out. When reading this book, there were several songs that reminded me of Zoey and Stenton’s relationship. Great review. Interesting points made! Thanks for taking the time to check it out.